The Word brought Light into the darkness – Christmas brings the Light of Christ into the world, providing comfort and courage. Bishop Frank J. Dewane celebrated the Midnight Mass at Epiphany Cathedral in Venice where the Gospel of Luke (2: 1-14), speaks in recognition of Christ and the birth of Our Savior that is still celebrated in the Church more than 2,000 years later. The Gospel is broken into two important parts, Bishop Dewane explained. The first part sets the time and place when the birth took place, namely in Bethlehem at the time of the census called for by Caesar Augustus. 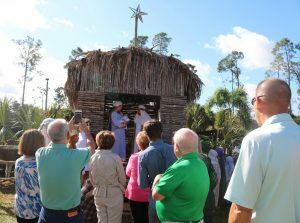 A Living Nativity at St. Agnes Parish in Naples on Dec. 16. This is stressed here as well as in the other Gospels related to the Birth of Christ so as to establish the voracity of the event; so there is no debate or confusion when the story is retold. The second part of the Gospel is about the shepherds who were given a call to be witnesses to the Birth of Jesus Christ. From them we learn about the simplicity of Jesus being born in the manger to Mary and Joseph and why there was no room at the inn. 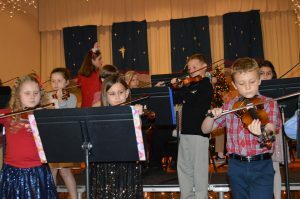 Students at Epiphany Cathedral Catholic School in Venice play the violin during a Christmas Pageant on Dec. 17. 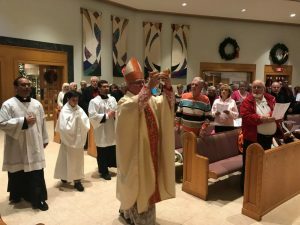 The Bishop also celebrated the Christmas Televised Mass for the Homebound from Our Lady of the Angels Parish in Lakewood Ranch, and asked everyone to prayer during the Christmas Season for the homebound and those who are alone or might be incarcerated. Throughout the Diocese of Venice, the Christmas Season was celebrated in a variety of ways. Parishes had Angel Trees from which parishioners could buy gifts for those in need in the community and for Catholic Charities programs. Several Parishes also had a Living Nativity, complete with live animals. The largest of these was a St. Agnes Parish in Naples and included a town laid out in the Parish Hall parking lot and actors portraying key figures in the Nativity Story. 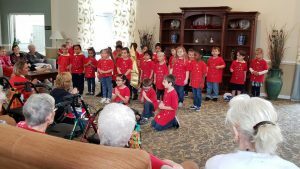 Kindergarteners at St. Joseph Catholic School in Bradenton sing carols Dec. 13 for residents at a nearby senior living facility. Catholic Schools throughout the Diocese contributed huge numbers of gifts to other children in the region. In addition, many held holiday pageants and concerts with nativity plays a common theme. Children also made gingerbread houses, caroled at nursing homes and others brought holiday cheer to those with disabilities.